After weeks of rain we finally have a sunny day here in The Netherlands! Perfect weather to spend time in the garden. Here are some images from our garden (in full bloom) and home that I took this morning. Enjoy the weather! Your garden looks spectacular. Congrats. Just lovely! 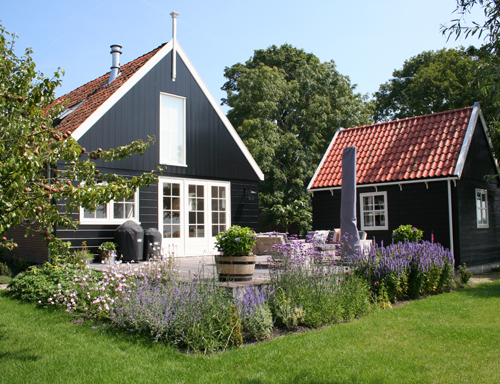 I love Dutch homes- so clean and they have great lines. My hands are very dirty from working in the garden today… it was lovely outside. Your house looks beautiful, with the very dark brown paint of the house and the purple flowers in your garden. Being from the southern US, it’s very unusual to see houses and barns in a dark color with white trim. Due to our excessive heat, our homes are usually light colors, or brick. The contrasting colors are so warm and inviting. Thanks for sharing. Looks beautiful! I guess the rain did your garden some good! trés jolie ambiance dans ce jardin. Oh my it’s sooo gorgeous. So envious! Would you please post (or repost?) photos of the interior of your home? After living through the manufactured “debt-ceiling crisis” in my home country of the U.S.A, I need some uplifting! Beautiful! Interesting idea with these two levels. Thank you for all your kind comments! We do consider ourselves lucky living here. 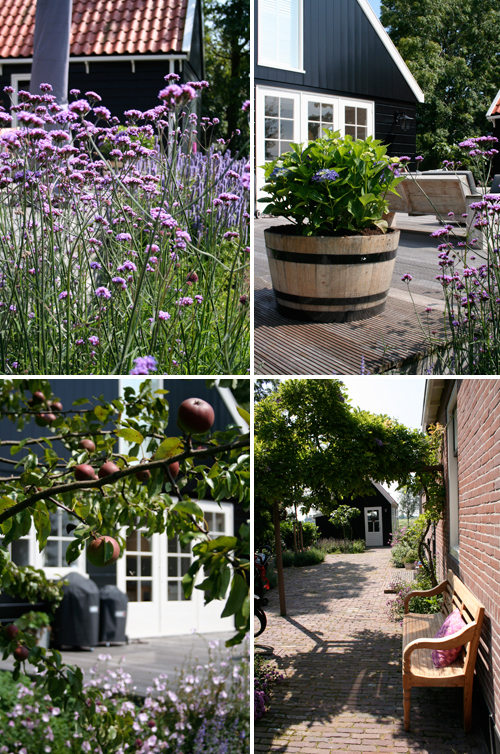 For the past 2 years we have renovated the house and garden and we are very happy with the end result. @Annie: it is verbena bonariensis (http://en.wikipedia.org/wiki/Verbena_bonariensis) that is growing in the garden. Very beautiful! I really like the different colors and textures. omg, this is just too gorgeous. that bench looks like the perfect spot for a mojito and a good book. What a lovely home and garden. Curious about the inside 😉 Will you share some of that too? Wow! Your house and garden is beautiful. I love the contrasts of the dark house and the greenery. I like your blog – alot! Such a charming outdoor space! Love the architecture and all the plantings. Beautiful! Beautiful home and garden! Must be as beautiful inside too!